Holla to the sun! I think it's starting to get a bit warmer in the day time. 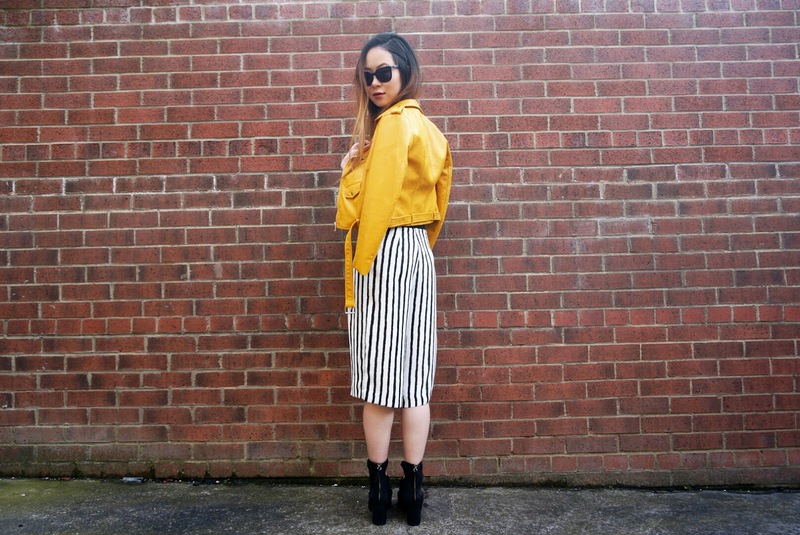 I mentioned in my Yellow Love post that I wanted to style my yellow leather jacket with some culottes for a summery vibe and here it is. I have been looking for a black culotte jumpsuit to wear with the jacket - I still haven't found the ideal one yet, but I picked up these stripe culottes from River Island. The quality of these are amazing and sits higher on the waist, so if I were wanting to wear this with a crop that can be done. I pulled out my black cami top that was sitting at the bottom of my draws and some Zara sandals that I bought last summer. It feels really good to bring back light summer items back into my wardrobe. For that pop of colour my Zara jacket and some Quay Australia sunglasses to finish off the look. Hope you enjoyed this look, until next time!